Very often I am asked by a needy, possibly homeless person for a handout. Disavowing the Conservative notion that these people are just going to buy booze, I generally oblige by giving a few dollars, depending on what I’m carrying and how needy they appear. Perhaps I’m being scammed, but the fact they are out in the generally hot Vegas sun to beg means they need it more than me. The universal response upon receiving the money is “God Bless.” I generally respond, that’s ok and go on my merry way. This past weekend, I decided to mix it up a little. Deciding this was a good time for a quick debate, I replied, ‘I don’t believe in god.’ He said, ‘really? You’re an Atheist? You’d better be an Agnostic, ya know, for insurance purposes.’ I replied, ‘if there’s a deity who’s so petty I must undoubtedly believe in his or her existence, I really want no part of that.’ I did mention that my religion is kindness to other humans and I don’t require a belief in the supernatural. Unexpectedly, the man replied simply, ‘Good point.’ We said our good byes and I drove away. 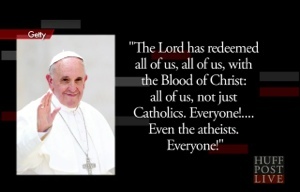 Recently, Pope Francis decided Atheists can also be redeemed and enter Heaven, so perhaps, in time, folks like us won’t be stereotyped as “bad people.” Because so much of our society is embedded with the thought that churchiness is directly proportional to goodness, people literally shudder when I mention my absence of theism. Having lived in Oklahoma for a few years, I learned not to disclose this information too publicly. People unfortunately mistake your public religious persona with your sense of morality. The monotheistic God is an illusion based upon the infantile emotional need for a powerful, supernatural father-figure and that religion, once necessary to restrain man’s violent nature in the early stages of civilization can, in modern times, be set aside in favor of reason and science. So…anyone wonder why science is being downplayed and attacked — and not taught? And why reason isn’t effective with religious zealots of any faith? Or why people are kept ignorant to be more programmable? Simply put, religion stifles emotional, scientific and social progress. The fact we have such a pronounced anti-science/pro-religion movement in this country demonstrates the antipathy between the two components of our society, proving they cannot symbiotically coexist. Heaven forbid we teach critical thinking to the indoctrinated. What value would religious fantasy have to a society that critically analyzes scientific concepts? This country continues to suffer at the hands of the über-religious, anti-climate change, anti-science, polluting plutocrats. This belief in God is a handicap that the Plutocracy requires for control of the brainwashed masses. The evidence required for something so extraordinary should be as extraordinary as the claim itself, yet no true tangible proof has been presented and for the deeply religious, no evidence is enough to satisfy their concerns. The idea that morality is co-dependent on religion is as ludicrous as the idea that we’re born with “original sin” as prophesied in a book of preposterous fiction. Saddling children with the guilt of this concept is cruel and downright crazy. The belief in God is just a mythic reproduction of the universal state of infantile helplessness. Like an idealized father, God is the projection of childish wishes for an omnipotent protector. And, hopefully, we all can see the paranoia of the religious right, their wish for the world to end and for their savior to save and protect them. The Republican party is furiously trying to revamp its tarnished image as racist sycophants who have no use for minorities, who they’ve clearly deemed inferior. The way they’ve chosen to go about this daunting task is to find new and improved policies designed to disguise their racist proclivities. However, this has backfired in ways no one could have imagined, as the fringe element of the party has taken over the asylum. It sure sounds like a wealthy person’s list of needed cheap labor. It’s pretty obvious who this entitled Mormon is working for in Congress. Perhaps it could also be something some of his FLDS voters require to maintain their lifestyle while staying under the radar in their polygamous compounds. Who knows? We know he’s a big proponent of anything advocated by the Heritage Foundation and against a pathway to citizenship for undocumented people. The Heritage Foundation recently came up with their own racially offensive survey on the intelligence quotient of Hispanic immigrants. 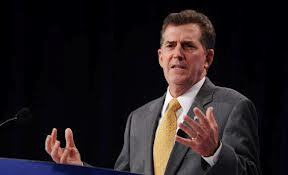 Jim DeMint, the former Confederate South Carolina Senator, claims legalizing undocumented immigrants will cost $6.3 trillion. He fails to mention this price tag is for a FIFTY YEAR PERIOD. The current leader of the Heritage Foundation has always been the enemy of anyone who happens to be poor, a minority, a homosexual or a woman. For instance, DeMint has said, ‘if someone is openly homosexual, they shouldn’t be teaching in the classroom and he holds the same position on an unmarried woman who’s sleeping with her boyfriend — she shouldn’t be in the classroom.’ He believed the Confederate Flag should fly over the capital statehouse in Charleston and naturally, his state was the last to remove it. You can still see plenty of Confederate flags waving in the air by the residents of the southern state that enjoys 47th in life expectancy and is the 3rd highest in infant mortality. So racist Jim retired from the Senate to make more money and have more power to shove his socially and fiscally conservative agenda down the throats of America. He and his ilk believe immigrants are just too damned expensive to the one percent’s ability to rob the coffers of Social Security, which is their ultimate goal. Their Utopian world consists of a Hooverville-esque nightmare for the American plebeian, because the Heritage Foundation is here to preserve America for the privileged white male. Immigrants, especially those Hispanics that maintain his lawn and clean his home, will never, according to his organization, get off welfare and earn an honest living. There are 69.5 million people dependent on the government for subsistence and this is simply too many for his liking. The problem with Utah Senator Lee is he’s dripping with Mormonism, and truly thinks, like Willard Romney, he is one of “God’s chosen leaders” in these “latter days.” He is absolutely against helping anyone if it should cost him the slightest inconvenience. Hell, he even hates the handicapped. Jim DeMint and his Heritage Foundation, another “Christian” group, has overtly come out against Hispanics in such an offensive way, their only Latino supporters may be GOP hypocritical “Hispanic” Senators, Ted Cruz and Marco Rubio, who are both of Cuban descent. Ironically, the Cubans are the only Hispanic demographic from which the GOP enjoys support. If these lunatics keep at it, they will lose not only every subsequent election when demographics are largely against their favor, but their existence as a legitimate political party will disappear. The GOP (a.k.a. the Misanthropic Party) has shown, with the election of Mark Sanford, they love a “good Christian” who begs for redemption but actually deserves none. In fact, pretending to be a good Christian while adhering to absolutely none of Christ’s Sermon on the Mount seems to be their modus operandi. Time will be the Republicans’ biggest enemy as America becomes darker, more diverse and thus their obsolescence is nearly assured. Following President Obama’s State of the Union speech, Senator Lee will be giving the Teaparty “rebuttal.” I’m not sure when the annual, Constitutionally-mandated speech delivered by the head of the Executive Branch, became some sort of debate demanding a rebuttal. No speech given by a single person, alone, without a massive presence like the House Chamber filled to capacity can compare with the President’s delivery, especially a skilled orator like President Obama. If you can stomach Senator Lee’s delivery, try to watch as these sound bytes will be replayed in the future documentary which could be entitled: The Meteoric Rise And Inevitable Implosion Of The Teaparty. Yes, this is a real picture. 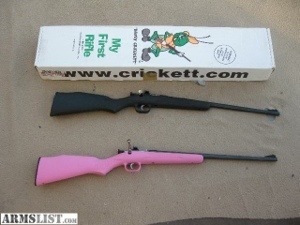 This is not a toy gun. A child is apparently responsible enough to hold the fate of a human life in his or her hands at the tender age of five. 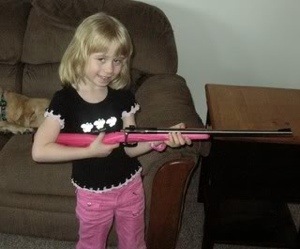 Americans have long ago decided one must wait until a person is eighteen to enlist in the army, but with the careful nurturing of a good Republican upbringing which includes a healthy dose of Jesus Christ, a child should be able to arm and defend themselves against a tyrannical government or maybe just someone who is annoying them, right? Homo-Sapiens imposter and fundamentalist nutjob Texas GOP Senator, Ted Cruz, claims the defeat of requiring background checks for the acquisition of firearms is a victory for freedom-loving Americans everywhere. The only winners are the gun manufacturers, lobbyists and the religious lunatics who claim god loves guns and can’t wait to revolt against the government. The civilized world looks on in horror as the NRA wins another battle desecrating the sanctity of life for children and Americans.